This month’s contribution comes from one of our students, Carole Suzanne Jackson, LMT. 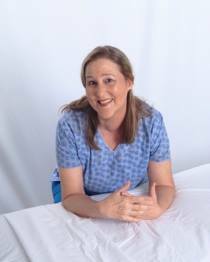 I met Carole during one of our Medical Massage seminars and it was obvious from the very beginning that she is an exceptional therapist who is hungry for knowledge and has an unstoppable desire to help her patients. Currently she is going through SOMI’s Medical Massage Certification Program and almost weekly she sends us questions, remarks and results of her therapies. It is fascinating to observe how quickly she’s obtained clinical expertise that results in treatment successes. One of my previous clients, a woman in her early forties, came to me with complaints about a “level ten migraine headache” she had suffered for three months. Her recent headaches were so severe that she went to a neurologist, who decided to do MRI to rule out brain tumor. Results rule out oncological nature of her headache. She was prescribed Pamelor 50 mg to which she developed an allergic reaction and increased intensity of her headache. A key factor from her history is that when she was 16 she suffered a bilateral fracture in her mandible after falling off the top of a cheerleading pyramid. During evaluation the patient exhibited tension and active trigger points (TP) in posterior and anterior cervical muscles. However, she also complained about restriction and pain during mouth opening and her jaw was shifted to the right. Even mild application of pressure during palpation of the cervical and masticatory muscles triggered intense pain. At the start of her first session the patient could hardly stand any pressure on cervical muscles. For the first thirty minutes I used the basic craniosacral technique with light pressure (like the weight of a nickel) on both sides of the head and fingers spread so as to have three digits above and two below the ears. After holding for about 5 minutes, her muscles started sporadic pulsation across all my fingers. She said she could feel something moving inside her brain. I applied Craniosacral Therapy for thirty minutes. After she was able to tolerate more pressure I started to prepare the soft tissue layer by layer using multidirectional friction on the cervical muscles with variating pressure and gradually applied careful Trigger Point Therapy. In order to be sure the patient didn’t generate protective muscle tension, I coached her first. We agreed that as soon as she felt that compression I would apply triggers pain she would let me know and I would retreat. After that I did a few seconds of more superficial techniques and then re-enter the TP using compression with growing intensity until the patient reported the first level of feel good tenderness changes within three seconds. During careful application of compression, the patient was instructed to use deep relaxing breathing and think releasing thoughts toward that area to engage the mind body connection. I held each compression for eight to twelve seconds and then released, followed by more superficial effleurage and manual vibration techniques. That sequence was then repeated up to three or four times as long as tenderness remained. A complete release of tenderness indicates readiness to repeat the process with increased pressure rather than holding for the full eight to twelve seconds. At the end of two hours of gradually working on the trapezius, pectoralis minor muscles and clavicle area and masticatory muscles, the patent was in zero pain with zero tension. Follow-up treatment frequency was determined by the patient observing when tension and pain returned. Her body indicated initial necessity of short break frequency and we used one day breaks between a total of nine sessions. Then we were able to decrease frequency to a weekly schedule until she graduated to holding the release for a month. The length of treatments also lessened due to quicker release and some muscles holding treatment longer than others. Self-care homework included: Epsom salt baths once or twice a day followed by Active Isolated Stretching which I taught her to do. The client has been able to maintain stable clinical results through daily self-care and supportive therapy. With a gentle and gradual approach to Trigger Point Therapy, rarely do my patients experience post treatment flare ups. The most reported scenario is muscle tenderness similar to when they start a new exercise program. But the pain for which they are being treated subsides significantly about 99% of the time, even at the first treatment. This therapy is perfect for gauging the optimal pressure especially for hyper-sensitive patients. Our mainstream medical system gave her no hope other than pain management through medication. The results from Medical Massage were so remarkable here that her neurologist asked for my card.